When deciding on the best winter camping tent, it's all about the tent's quality of weatherproofing and structural stability under harsh winter storm conditions. The following ten winter camping tents are consistently rated among the best by backpacking experts and consumers. Cool of the Wild ranks the Mountain Hardwear Trango 2 at the coveted number one spot on its list of best cold weather tents. 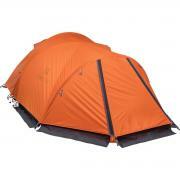 This tent has the renowned DAC Featherlite poles that make it extremely resilient (though heavy to carry). Its 70D DWR nylon floor and fly are practically indestructible, and campers love the ventilation and windows for light. Named the top overall winter tents by Outdoor Gear Lab, the Hilleberg Jannu 2 is one of the mightiest tents on the market and most resistant to stormy weather and snow loading. It doesn't have as much space as other winter tents, but it makes up for it with its highly weatherproof design and excellent ventilation and window set-up. Chosen as the best cold-weather camping tents by Arbor Explorer, the affordable ALPS Mountaineering Lynx 1 is a lighter weight winter tent that has superb weatherproof features that include a 2000 mm factory seal on the tent's floor, rain fly and floor seams. It also has big number eight zippers on the entrance and vestibule, which add a nice touch to its easy exit/entrance design. In Outdoor Authority's ranking, the high-end Arctic Oven Igloo nabs the honor of being the best. Unlike the first three tents ranked above, this heavy winter tent (37 lbs) is not meant for backpacking but for car-side camping in very cold, stormy conditions. Its heavier weight means it is very well insulated and designed for warmth. It even has a space for a stove. The North Face VE 25 has earned a top spot on Cool of the Wild's winter tent rankings. This tent is bigger than many winter tents on this list (it sleeps three people), it has strong double wall weather protection and its extra roominess allows for two vestibules. Having possibly the coolest name on the list, the Marmot Thor (yes, Marmot as in the funny animal and Thor as in the Norse god/Avenger/Chris Hemsworth) is ranked the second best overall by Glacier National Park Travel Guide. Its supreme ruggedness has earned its affiliation with Thor. The tent is designed to keep you dry and comfy on the top of brutal mountain summits like the ones in the Rockies where storms can come at any moment. Winning the second-place spot in Arbor Explorer's top winter tents, the ALPS Tasmanian 2 is a quality tent with the nice bonus of the ALPS lifetime warranty. Carefully designed covers on the interior of the windows and ventilation ensure you'll stay warm and cuddly even in freezing temperatures and wind. Even though it's only a two-person tent, its extra large rain fly extends to ground and creates a roomy second vestibule usually found on larger tents. The Black Diamond Eldorado nabs the number four spot in Cool of the Wild's winter tent list. This tent is one of the most durable, weatherproof single wall winter tents on the market. The designers coated the single with PTFE (what the material Teflon is made of), which gives it an edge over most other single wall tents that use polyurethane. It's an especially long tent, which is nice for tall people, and it's a perfect tent where you'll need to camp quickly because of unexpected weather. Rated one of the top choices by Glacier National Park Travel Guide, the Black Diamond Stormtrack's double entrance/exit tent also has a double wall that prevents the wind from lifting it. The tent's 15 anchor points keep it stable in harsh storm conditions. It's also less expensive than Black Diamond's Eldorado. Rated as one of the top three winter tents by Outdoor Authority, the affordable Eureka Alpenlite 2XT weighs only six pounds and has grommet corner attachments for quick and easy setup during extreme weather. The front vestibule gives campers a place to stash snowy boots and clothing without getting the main area of the tent wet. The steep walls help snow slide off instead of piling up top.